Article in the German Newspaper "BILD". To celebrate our 30 year Anniversary this Article was published with 20 Newspapers in North Germany. Im Auftrag der Werft Nobiskrug - Rendsburg waren die Nordseetaucher an den Bergungsarbeiten des Schleusentores erfolgreich beteiligt. Das Tor wurde unter Wasser in zwei Hälften getrennt und geborgen. Die Arbeiten unter Wasser wurden ausgeführt in Zusammenarbeit mit Taucher Knoth. 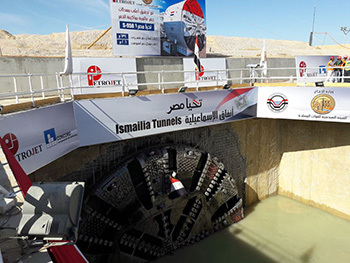 The 4 TBM's under the Suez Canal in Port Said and Ismailia are through. N-Sea-Divers was responsible for the Hyperbaric Work in Air and Mixed Gas Saturation. N-SEA-DIVER as member of the GMT-German Association for Marine Technology is part of the InWater Solution Exhibition on the SMM 2016 in Hamburg. Our part is Environmental Cavitation Cleaning inclusive Recycling. We are pleased to inform you that Mrs. Jennifer Mayer (M.Sc.) has entered the Nordseetaucher GmbH as Business Administration Manager on 1 January 2016. She is representing the company as authorized signatory. N-SEA-DIVER was in 2015 part of the InWater Solution Exhibition on the Hannover Messe. Our part was Underwater MAG-Welding and Hull Cleaning of Vessels and Offshore Structures. The NST Diver/Technician Team is succesful back on the surface. They have done 11 interventions with in total 243 Work Hours at 10.8bar in Mixed Gas Satuaration. On the Deep Tunnel Project S-762 under the Bosporus in Istanbul -Turkey the Diver/Technicians of NORDSEETAUCHER have reached the working depth of 10.8bar. The Maintenance and Repair Work will be carried out in Compressed Air and Bentonite by using a new designed Mixed Gas Helmet. The Diver/Technicians have already spent more than 314 work days successful in Mixed Gas Saturation on the Weisan Road River-Crossing Project in Nanjing-China. Since 2 weeks the Diver from NORDSEETAUCHER GmbH are changing the Cutterhead Discs in Bentonite. What means they are working without visibility and, YES it works. Today, after 18 days, the first Mixed Gas Saturation Intervention on the South Line Tunnel Boring Machine of the Weisan Road River-Crossing Project in Nanjing-China, in co-operation with CCCC-China Communication Construction Company has been successful finished. Three Diver/Technicians From NORDSEETAUCHER GmbH have been busy on the TBM down to 6.1bar. The work they carried out was repair work on the Cutterhead. The Second Team in Mixed Gas Saturation is already busy since 4 days. The new Mixed Gas Saturation Generation for Hyperbaric Tunnel Work is designed. Since the 10th of September 2013 the System in Nanjing-China is operating at a depth of 6.1bar. The containerised system is located on the surface. From there the shuttle will be transported with a truck into the tunnel and with a special designed Transport Unit lifted up for connection to the personnel lock. In co-operation with CCCC - China Communication Construction Company 2 new Road Tunnel will be build under the River Jangtze in Nanjing. The maximum overpressure will be 7.4bar. The Mixed Gas Saturation System will be delivered by Hytech BV in co-operation with Nordseetaucher GmbH. The length of the tunnel will be 3.433 m and 4.140 m.
In co-operation with the Herrenknecht AG and CRCC – China Railway Construction Company, the cutter head tools of S-349 / S-350 will be changed in compressed air by 6.0 bar overpressure. Also necessary welding works will be done in 6.0 bar overpressure. To link the popular country inn Unterkrummenhof to the electricity network, a team of Nordseetaucher divers and technicians from electrical engineering specialists Kundt Elektrobau laid a cable along the length of Lake Schluch in July 2007. In September 2007, a team of Nordseetaucher divers laid two cables along the bottom of the Wendefurther reservoir, from the pump storage station to the transformer station below the Rappbode barrage. November 2007: Laying a medium-high voltage cable from Königssee to St. Bartholomä. Nordseetaucher GmbH has been awarded a contract by Nexans GmbH, Hanover. In November the two companies worked together at Königssee to replace a 50-year-old PVC-insulated cable with a new 20-kV undersea cable (3 x 35 mm²) with VPE insulation and round wire cable armouring. In co-operation with CNES and under contract of IMS the Booster Recovery of the Ariane 5 Mission V 537 has taken place approx. 380 miles east of Kourou in the Atlantic. The booster has been salvaged and safely towed back into the harbor of the space centre at Port Pariacabo. In co-operation with OceanTeam 2000 we have inspected several platforms in the Danish Sector for Maersk Oil and Gas. The vessel for the operation was DSV "Maersk Recorder". The specialists of Nordseetaucher GmbH have finished the first part of the water pipeline repair in India. The damaged pipe was cut under water with a hydraulic controlled rope saw. After that the old and the new pipe section got connected with a Plidco Flange System. When the test run is finished the new diffuser has to be installed, connected to the pipeline and protected against damage. The special trained underwater wet welders of Nordseetaucher GmbH have finished the second underwater oil pipeline repair in South Africa. The pipeline is tested with success and again under production.. In Cooperation with IMPaC Engineering our qualified professional welder divers have finished the first of three oil pipeline welds under water for PetroSA, South Africa. The pipelines were damage by a vessel anchor during mooring operation. In August 2005, Nordseetaucher GmbH was contracted to salvage the passenger barge "Seehund I" which had sunk off the coast near Büsum in northern Germany. The vessel had gone down at a depth of 5 metres. With the aid of 2 inflatable pontoons and lift bags, we succeeded in lifting the former passenger barge. A tug operated by Schramm, Brunsbüttel, was used to tow the barge into Büsum harbour. Finally, two cranes were used to lift the wreck onto land. The vessel for the operation was DSV "Kingfisher". We were contracted by the insurance company to search for the yacht, which we did at the end of 2004 and the beginning of 2005; we located it with the aid of SideScanSonar and a ROV. In April, we successfully lifted the yacht from a depth of 86 metres and handed it over to the insurance company. The wind measure mast was erected in the North Sea to collect data for the Offshore Windpark AmrumBank West. 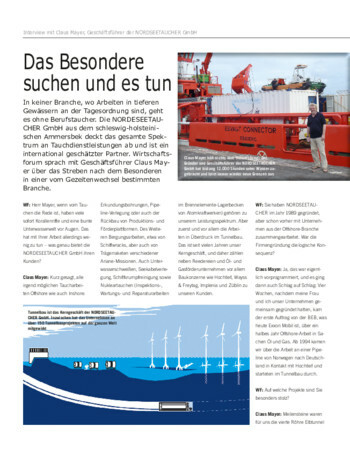 NORDSEETAUCHER GmbH was contracted by HOCHTIEF Construction AG to provide offshore services from our dive ship "Aurelia" and the water safety vessel "Victor Hensen". The oil and gas pipeline "Blue Line" is under construction from Baku on the Caspian Sea via the country of Azerbaijan and Georgia through Turkey to the Mediterranean harbour of Ceyhan. The Herrenknecht TBM M-929M is a mixed shield slurry shield. The tunnel diameter is 1.60 m and the tunnel length is 2 x 400 metres. To support the working face the shield tunnelling machine will work in closed mode to permit maximum pressures of 3,0 bar, which is the equivalent of a water depth of 30 metres. The world’s largest earth pressure balance shield, which has a diameter of 12.06m, started work on the Metro line 9 in Barcelona in September 2003. We have recently completed compressed air work at 2.0 bar on this project; this was the first time we have worked on a TBM project in Spain. We were contracted by the Technical University of Munich in cooperation with E.ON-Wasserkraft AG to help build a fish research plant to bring in eels from the River Main. This required us to drill two core holes underwater (diameter 700mm, length 4000mm). Nordseetaucher has been contracted by OceanTeam Offshore to work with Bluestream on platform inspection and maintenance work in the Gorm Oilfield, Denmark. On behalf of Johan Bunte Bau, we have just completed a contract for underwater work in the Dortmund-Ems canal at Olfen. We were contracted to lay concrete foundations for two sill beams and four attachment points, and then install two dock gates. The canal was the rerouted through these new gates and the old Stever outlet was closed up. Together with Framatome AnP, we have just completed maintenance work in the reactor and settling tank at the research reactor FRM II in Garching near Munich. Nordseetaucher is currently working on repairing and refacing the damaged steel piling walls at berths 7, 9 and 11 at HDW (Howaldtswerke Deutsche Werft AG) in Kiel. What makes this job challenging is the fact that the new facing must be applied below the pier plates and the concrete has to be pumped in from below. The plates are each four metres long. We were contracted by CNES and IMS to work with them on recovering the booster rockets of Ariane 5 Mission 517. These have now been recovered from the sea approx. 280 nautical miles east of Kourou, despite the terrible weather, with waves topping heights of 6 metres, and have been towing back to the Space Centre at Port Pariacabo and landed. Together with Framatome-Siemens, we replaced several of the existing storage racks in the element storage pool with larger racks. The work took around eight weeks. As part of the construction of the new bridge over the Schlei in Kappeln, for the very first time, load-bearing seams were welded under water with an a-dimension of up to 10 mm. In total, 229 m2 of steel piles were protected by applying LECO coatings underwater. With the aid of a 1000t floating crane called "Roland", the 250t, 30m long, 10m wide and 12m high steel dock gate was hoisted into position between the River Warnow and the construction dock in Rostock. The dock gate is to be used to close off the construction pit and allow the next tunnel segments to be laid in dry conditions. Our contribution to this project included supervising the construction of the dock gate in Hamburg, bringing it to Rostock through the Kiel Canal, installing it between the Warnow and the construction dock, sealing it, and then removing it and reinstalling again to allow more tunnel segments to be made and floated into position. In the record time of just six months, the shield tunnelling work for the northern tunnel of the Wesertunnel at Dedesdorf near Bremerhaven was completed on 7 November 2001. For the fourth time, a team from Nordseetaucher GmbH was involved in the survey work on the sunken ferry Estonia. We used our Remotely operated vehicle Hyball to carry out the surveillance work. Due to the high pressures of 6 bar at the working face, the cutting tools of both TBMs were replaced by divers from the HTDaC Consortium, Nordseetaucher GmbH and Noordhoek Diving B.V. The divers spent up to 14 days in hyperbaric conditions to carry out this work. The divers were brought to the face with a special pressurised shuttle which was docked on to the TBM and disconnected after work had been completed. The Seeschleuse Leer consortium, which consists of Bitek Bergungsdienst GmbH and Nordseetaucher GmbH, has completed the replacement of the slide rails at the Leer sea lock. The work was carried out within a caisson. The dimensions of the caisson were: length 11.50m – width 4.50m – height 2.50m – shaft 9.00m. The caisson was equipped with two airlocks. In a joint project with CNEF and IMS, a team from Nordseetaucher GmbH was involved in recovering the boosters of the Ariane 5 rocket.